Armadillos have a couple of assets that often keep them safe from the clutches of hungry predators. Their sensitive hearing, for one, can alert them to looming hazards in their vicinity. If audible clues don't help them escape quickly enough, their bodies are adorned in tough, protective shells. Armadillos possess keen hearing abilities. Not only are they equipped with strong hearing, they're also equipped with quality olfactory skills. Both of these senses come in handy as armadillos go about their normal lives. When the wee mammals seek out food, they often park their noses onto terra firma. They walk around diligently employing their ears and noses, listening for and sniffing out food in their vicinity. 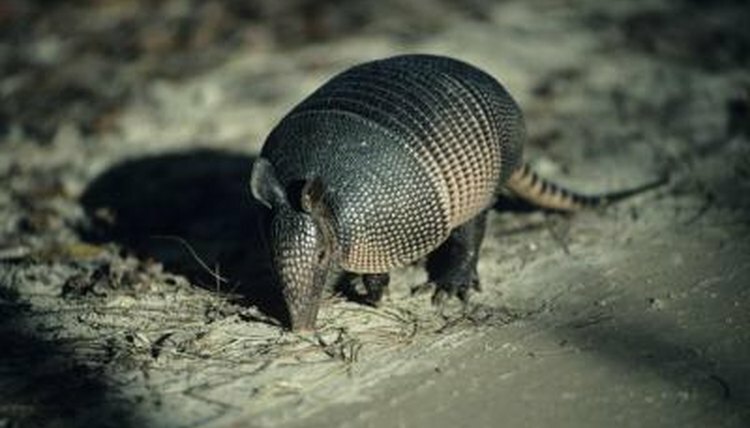 Armadillos of some species possess big ears that jut out or are shaped similarly to cylinders. Certain types of armadillos have bigger ears than others, although they all share sharp hearing. Large ears can help them detect low frequencies such as the subtle motions of insects in the dirt. Armadillo ears move from side to side, which enables them toprecisely target their prey, whether they are insects or lizards moving around. Certain armadillo species are adept at picking up on low frequencies. This is important for those that do a lot of burrowing. Low frequencies travel in underground environments more successfully than higher frequencies. Screaming hairy armadillos (Chaetophractus vellerosus) have hearing conducive to burrowing. Large hairy armadillos (Chaetophractus villosus) are also well adapted for subterranean hangouts. They, too, are usually seen underground. When armadillos hear low frequencies, they are forewarned of predators coming close to their burrows. While smell saves the day for armadillos and their dining needs, their hearing often manages their predation woes, both inside and outside of burrows. A wide array of animals prey on armadillos. Some common armadillo predators include people, bears, dogs, coyotes, raptors, jaguars and pumas. When predators get close to armadillos, their tough shells often help protect them, too. How Does a Burrowing Owl Protect Itself From Predators? What Predators Eat the Walking Stick Insect? Where Do Two-Toed Sloths Live? How Do the Honey Bears Live in the Amazon Rainforest?